Dungeness crab has a singular salty, clean, rich taste paired with a soft texture that almost melts in your mouth. There are a million things you can do with crab meat, ranging from minimal hassle to intricate manipulation of that special flavor. Fresh steamed crab can be enjoyed straight out of the shell, with a little butter and lemon, or it can be whipped into a dip, molded into a crispy, flavorful cake, or tossed into any number of mouthwatering recipes. For many, the epitome of Dungeness crab enjoyment is rooted in simplicity. Steamed and cleaned whole crab needs nothing more than some lemon juice and melted butter. But others crave a little adventure in a dipping sauce. Consider adding Aioli to your options this year. Put the garlic, mustard and egg in a food processor or blender. Blend on low while slowly adding the oils. Then add remaining ingredients and pulse until smooth and mixed. Results are best if you let the sauce stand for half an hour before serving. Billed as a crowd pleaser, this salad or chunky dip takes a mere ten minutes to make. Give your guests a choice to go light, by spooning some onto a bed of greens, or to go hearty by spreading it onto a roll or pita chips. Heat the oil in a nonstick pan. Saute the onion, celery, peppers and garlic for about four minutes, or until tender. Let cool to room temperature. Meanwhile, mix your fresh crab with the mayo and seasonings. Toss gently to combine everything. Cover and chill for an hour. Remember that crab meat spoils quickly, so make this salad on the same day you will serve it. Holiday meals can be tough with younger, picky eaters. But kids (and adults) are very unlikely to turn down a crispy, tasty crab cake. This recipe goes light on the filler for increased flavor and protein. Line a baking sheet with tin foil. Mix the eggs, mayo, mustard, Worcestershire, Old Bay, salt, celery and parsley well. Add the crab meat and bread crumbs. Gently fold until combined. Try not to shred the crab meat. 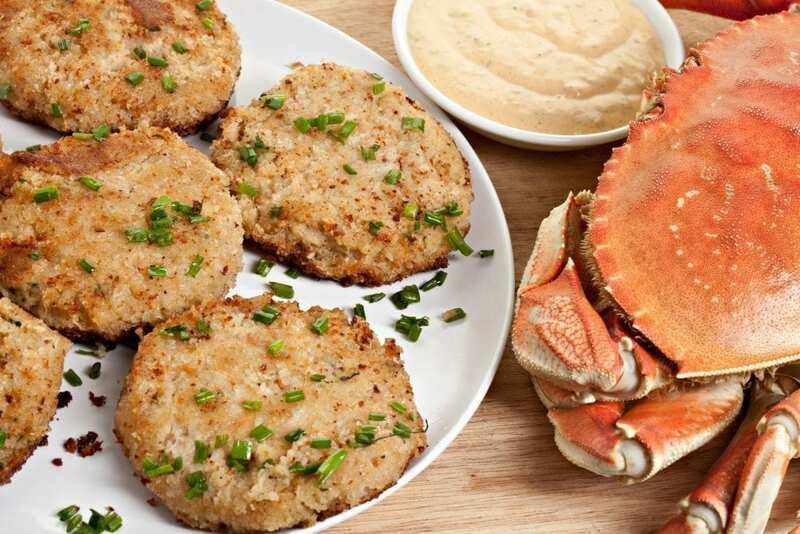 Shape into 6 crab cakes and place on baking sheet. Cover and cool in the fridge for at least an hour. Preheat a nonstick pan and coat with oil. Cook the cakes until golden brown on each side. This should take less than five minutes per side. Serve immediately with tartar sauce, lemon wedges or cocktail sauce.